Only 2 days after PEAMcoal, the vehicle set up by Peabody energy and ArcelorMittal to buy Macarthur, announced it obtained a majority interest, Arcelor decided to get out of the combination. The company will sell the 16% of Macarthur it had to Peabody. Peabody had teamed up with ArcelorMittal because an earlier bid had not gained the support of the major shareholders. 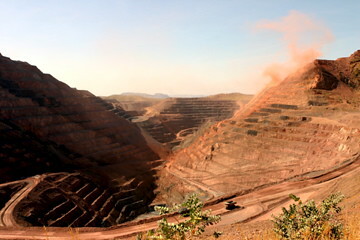 Vale posted disappointing results for the 3rd quarter: the weak Brazilian real compared to the US dollar hit the company hard, iron ore spot prices dropped 27% q-on-q, and production volumes were lower than planned. The move of ArcelorMittal out of the Macarthur acquisition is a surprising sign of hesitance and uncertainty about the development of the global steel market. The company prefers cashing $700mln over having to pay an additional $1.2bln to get 40% of the Australian coal miner. It still plans to build an iron and coal mining business to increase self-sufficiency. US steelmakers are also struggling and iron ores prices have plummeted in expectation of falling steel demand. Exchange rates remain a very important factor in the competitiveness of miners because sales for miners around the world are typically in US dollars, irrespective of the currency in which costs are incurred. As shown in the exchange rate graphs below the Brazilian real has been hit harder than the Australian dollar, key currency for iron ore production of Rio Tinto and BHP Billiton, in the past quarter.